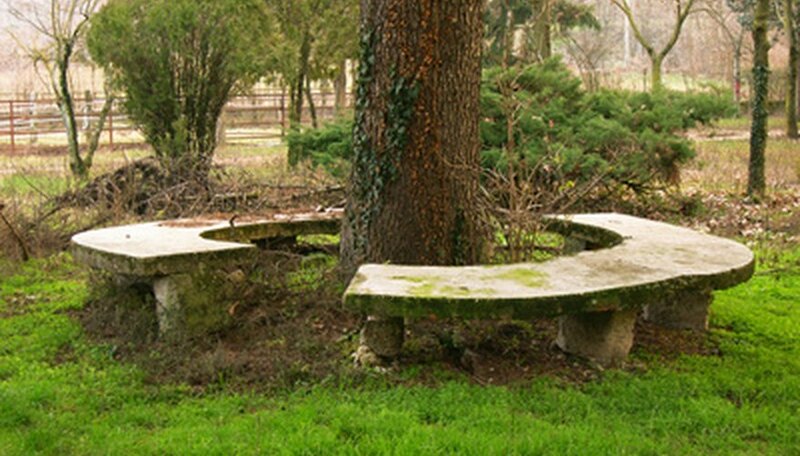 Building an octagon bench around a tree is easy because one angle fits all. You can buy all the parts, cut them and build a wraparound bench in one afternoon. Make it out of inexpensive 2 by 4’s, or use redwood, cedar, or composite deck material. This design has an inside diameter of approximately 52 inches, but can be lengthened or shortened to fit any diameter of tree. Clear and flatten any uneven ground around the perimeter of the tree. Set the miter saw at 22.5 degrees and cut eight pieces of 2 by 4, short point to short point of the miter measuring 24 inches. Lay them out around the tree to get a pattern established, looking for roots that might interfere with the leg pattern. Cut 32 pieces of the pressure treated 4 by 4 at 16 inches for the legs, and 32 pieces of the 2 by 4’s at 16 inches for the braces. Lay two of the legs down parallel with each other and screw a 2 by 4 brace flush with the top, and ends—it should look like a upside down “U” with a square top. Flip the piece over and screw another 2 by 4 brace on the opposite side parallel with the first brace sandwiching the top of the 4 by 4’s, build all eight. Lay all eight legs/braces at the corners on the inside of the pattern. Stand up two of the brace/legs and lay a mitered piece between the two, beginning the inner perimeter. Slide the miters together leaving about a half inch. Put one screw down through the 2 by 4 on one side brace, then reach over and put a screw down through the other leg/brace. Stand up another leg/brace, place another mitered 2 by 4 on it, spanning to the one you just built, and put a screw through it. Repeat this until you have worked all the way around the octagon, adjusting the pattern as you go. Measure for your next layer by measuring from the long point of the miter on the octagon’s outside perimeter, and making that your “short” point on the next layer. Follow the pattern until you have worked all the way around. Repeat for the next two layers. Even the best craftsmen can’t build perfect octagons. Be sure to leave at least a 1/2 inch of space between the miters and the layers side by side for adjustment to the pattern. When nearing the end of a series of layers, the miter angle can be adjusted as well. When the octagon is fully assembled, go through and add more screws where needed. Its not necessary to pre-drill 2 by 4’s, but they can split if a screw is too near the edge. Go easy at first. "How to Design and Build a Custom Tree Bench"